The Lasergraph DSP compact travel Playback laser show control system, made by Laseranimation Sollinger, is especially designed for high professional show applications. The Lasergraph DSP compact travel Playback is a powerful show control system can be used for controlling many kinds of media, like DMX fixtures, video content, special effects and water effects. 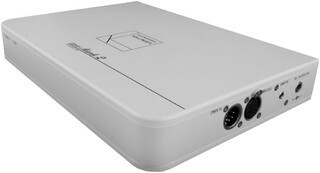 The Lasergraph DSP compact travel Playback Mark 2 is a single-channel system in a ABS Polymer housing. The housing is very compact (280mm x 200mm x 40mm) and lightweight (1.3kg). All you need for playing back DSP laser shows without the editing function. Together with a Lasergraph DSP compact and just one Licensor Licence in a network, every Lasergraph DSP compact Playback becomes a Lasergraph DSP compact with full edit function!